How does “Dumbo” rank among the studios remakes of its animated hits? Over the last decade, Disney has found itself dipping increasingly into its own well of nostalgic favorites. Specifically, they’ve been taking their beloved animated classics, remaking them in live-action (or mostly live-action), and producing one blockbuster smash after another. Not all of these live-action Disney remakes are good, and some of the bad ones have unexpectedly interesting ideas. And some of them actually predate the current (and seemingly never-ending) wave. Let’s take a look at all of the live-action remakes of Disney’s animated classics, going all the way back to the 1990s, to explore which films improved on the original and which ones came up short. 13. "The Jungle Book" (1994) The first live-action Disney remake of an animated Disney classic is, somehow, still the worst. Stephen Sommers (“The Mummy”) directs this frustratingly inert take on Rudyard Kipling’s stories, which strips the animals of their characterizations and highlights instead the bland experiences of British colonizers, who condescend to Mowgli (Jason Scott Lee) at every turn. Some of the supporting performances, especially by Cary Elwes and Lena Headey, are noteworthy, but the rest of the movie is a sloppy throwback to a mercifully bygone era of adventure filmmaking, full of backwards mentalities and underwhelming action. 12. "Christopher Robin" (2018) The beloved stories of A.A. Milne have been previously adapted by Disney into several beautifully animated and heartwarming motion pictures. So it’s especially cloying that Marc Forster’s “Christopher Robin” just plops these timeless characters into a tepid and cookie-cutter family flick about a dad who -- gasp! -- spends too much time at work, and rediscovers his inner child thanks to the return of his old, magical friends. 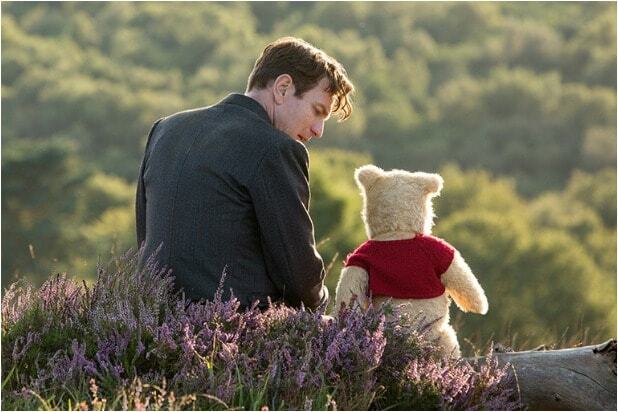 Ewan McGregor shines as the adult version of Christopher Robin, but the melancholy cinematography, underdeveloped screenplay and creepy VFX renditions of Pooh and his friends make “Christopher Robin” a rough slog. 11. "Alice Through the Looking Glass" (2016) James Bobin’s sequel to “Alice in Wonderland” certainly looks like an improvement on the original, with vibrant production design and weird visual effects, and a tone that’s mercifully less grim. But the time-travel storyline, which sends Alice back to the early days of Wonderland (sorry, “Underland”) to become the cause of all its miseries (including a genocide), retroactively injures the original film, which had a boatload of problems in the first place. 10. "Beauty and the Beast" (2017) Despite the excellent source material and a decent cast, Bill Condon’s remake of “Beauty and the Beast” has the unfortunate distinction of being the only live-action Disney remake that has absolutely no new interpretation of its material. It’s just the exact same story but longer, and only because of unnecessary additions that arbitrarily pad the running time, confuse the characters’ motivations, and shoot holes in the already thin plot. Add in some ugly character designs and an utterly forgettable new song, and you’ve got a film which made Disney a lot of money, but artistically has no particular reason to exist. 9. "Alice in Wonderland" (2010) Tim Burton’s blockbuster retelling of “Alice in Wonderland” is unnecessarily murky and violent, and -- worst of all -- devoid of Lewis Carroll’s signature wit. Mia Wasikowska stars as Alice, who has forgotten all about Wonderland (sorry, “Underland”) and returns years later, only to find it taken over by darkness, a problem that can be solved only by more war. The film comes across like a cynical attempt to make a classic story edgy and marketable, but at least there’s an interesting attempt to transform Alice into a modern and active heroine, and the film’s ensemble cast boasts some real highlights, including Helena Bonham Carter as the Red Queen, Anne Hathaway as the White Queen, and Stephen Fry as the Cheshire Cat. 8. "102 Dalmatians" (2000) Kevin Lima’s sequel to the hit “101 Dalmatians” remake is strange and cartoony but, in its defense, completely unapologetic. Glenn Close returns as the despicable Cruella de Vil, now rehabilitated via brainwashing and eager to rescue puppies instead of murdering them. When her programming wears off, she resumes her wicked ways. There’s not much more to it than that, but the film’s astounding costume design and Close’s pitch-perfect performance make “102 Dalmatians” an amiable, if shallow, piece of children’s entertainment. 7. "Maleficent" (2014) Disney’s “Maleficent” isn’t so much an adaptation of “Sleeping Beauty” as it is quasi-family-friendly riff on Abel Ferrara’s “Ms .45.” Angelina Jolie stars as a fairy who gets betrayed and violated by her human lover and left physically and emotionally scarred, so she plots her revenge against him by cursing his daughter, played by Elle Fanning. The cinematography is hard to make out a lot of the time -- and once you do get a good look at some of the CGI creatures, you’ll wish it stayed that way -- but the bold new interpretation of the source material and Jolie’s exceptional performance elevate “Maleficent” above its shoddy VFX and extremely sloppy storytelling. 5. "101 Dalmatians" (1996) Stephen Herek directed a trio of live-action Disney hits in the 1990s -- “The Mighty Ducks,” “The Three Musketeers,” and “101 Dalmatians” -- and they’re all satisfying family-friendly romps. Jeff Daniels and Joely Richardson play humans whose dogs fall in love and have oodles of puppies, and Glenn Close portrays Cruella de Vil like a pitch-perfect 1960s “Batman” villain. The film devolves into brainless, non-stop “Home Alone” slapstick in the second half, but it’s never less than fun, and Close gives such a gloriously unhinged performance that she’s practically Oscar-worthy. 4. 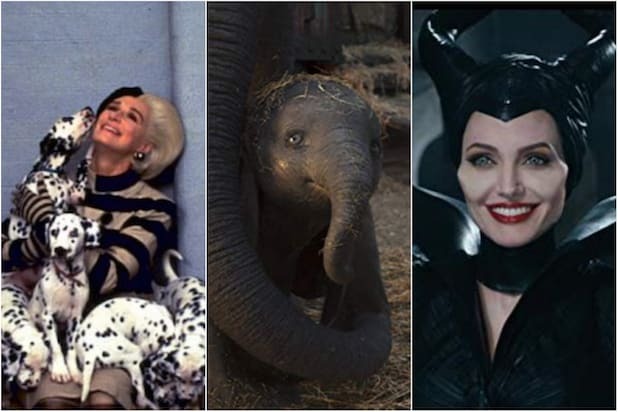 "Dumbo" (2019) Tim Burton’s second live-action remake of a Disney animated classic is more clever, more emotional and significantly more subversive than his “Alice in Wonderland.” It’s still the story of a baby circus elephant with giant ears that help him fly, but this time his circus is purchased by a theme-park entrepreneur played by Michael Keaton, who proceeds to lay off most of the workers after the merger and to exploit his newly acquired IP beyond reason. Disney has often turned heartless capitalists into their villains, but in “Dumbo,” the studio seems to be pointing the finger at itself, giving Burton’s richly realized fantasy an unexpected and impressive sting. 3. "The Jungle Book" (2016) Jon Favreau’s “The Jungle Book” uses so much CGI that calling it “live-action” is probably a misnomer; there’s only one character who isn’t motion-captured, and even the realistic environments were digitally rendered. But either way it’s an excellent film. Favreau eschews the laidback, episodic structure of the original in favor of a more focused adventure, with Mowgli (Neel Sethi) gradually taking responsibility for rescuing the jungle from the deadly Shere Khan (Idris Elba). An all-star cast of mo-cap animal characters keeps the film lively, although Christopher Walken is a distractingly strange choice for King Louie. 2. "Pete’s Dragon" (2016) Another nebulously defined “live-action remake,” since the original “Pete’s Dragon” was a mostly live-action musical fantasy with one animated title character. David Lowery’s remake does away with all the classic songs (which ranged from adorable to weirdly violent) and also throws out the wackier storylines. Instead he highlights the emotionally sincere story of a lost boy whose only friend is a giant dragon. When Pete is discovered and brought back to the human world, his dragon, Elliot, comes looking for him. Lowery makes room for comic shenanigans, but he’s mostly interested in exploring our contemporary capacity for wonder. He transforms a formerly eccentric tale into something beautiful and, possibly, timeless. 1. "Cinderella" (2015) Disney’s original “Cinderella” is a masterpiece of animation, but it’s also a narratively thin piece of wish-fulfillment. Kenneth Branagh’s live-action remake keeps the original, classic storyline in place but amplifies the characters, giving the wicked stepmother (Cate Blanchett) a meaningful motivation for her treatment of Cinderella (Lily James), giving Cinderella a set of clearly-defined principles that justifies her every decision, and giving the prince (John Madden) enough time with Cinderella that they can actually fall believably in love. Romantic, beautiful and -- from a story perspective, at least -- an undeniable improvement on the original, “Cinderella” is the crown jewel of Disney’s live-action remakes. For now.